The Doyle name comes from the Irish Gaelic for Dark Foreigner or stranger ‘Dubhghall’. This is taken to be a reference to the Vikings who arrived in Ireland in the late 8th century. They came from the Scandinavian countries, in particular Denmark, and settled around the coastal counties of Eastern and South Eastern Ireland. These counties of Wexford, Waterford , Wicklow, Dublin and the adjoining counties of Carlow, Kilkenny and Tipperary are considered to be the homelands of the Doyles. The history of the Vikings is the history of the Doyle clan in Ireland. Wexford County has a large population of people of the name Doyle. Every town, village, townland, particularly in South Wexford is sure to have at least one Doyle family. They are farmers, butchers, pub owners, teachers, sportsmen and women; every walk of life is represented. As you walk the streets of Wexford town, Enniscorthy, New Ross and Gorey and the surrounding villages, keep an eye out for the Doyles. 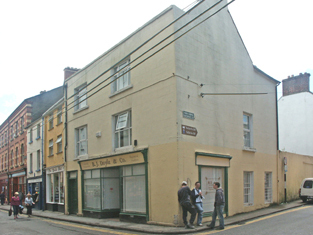 Wexford town is situated near a shallow harbour at the mouth of the River Slaney in the South East of Ireland. The Vikings arrived in the 9th century and called it ‘Waesfiorde’, meaning ‘the bay of the mudflats’. This was anglicised as Wexford and replaced the Gaelic name of Loch Garman – still used as its name in the Irish language. The streets are narrow with some narrower streets leading towards the waterfront and running parallel to the current Main St. Can you spot the B J Doyle business on the corner? Take a walking history tour or wander the narrow streets yourself. An interesting coincidence happened in Wexford in 1988. A local businessman was redeveloping a site at the corner of Bride St and South Main St. During the construction, ancient building foundations were discovered. These were investigated by archaeologists and were found to be the site of two Viking houses dating to around 1,000 AD. The name of the businessman was Colman Doyle, providing a link of across a thousand years between the ‘Dubhghall ‘, the’Dark Foreigners’ origins of the Doyle name and a current day Doyle. The building work was completed and the business continues to-day. Wexford is home to the Irish National Heritage Park which includes a replica of a Viking Longship and houses. It is situated beside the river Slaney, a river the Vikings would have used in their travels upriver to Enniscorthy and inland to County Wicklow. As I watched the arrival of the Longship to the Heritage Park several years ago, there was an eerie sense of ‘deja vue’. Perhaps it was the spirit of my long gone Irish forbears running away in fear or the bloodthirsty Viking roots looking for plunder! Take a kayak out on the Slaney yourself and experience the town from the sea just like the Dubhghalls! Selskar Abbey is a notable building in Wexford town. Although founded as a place of Christian worship in the 12th century. It is said to have formerly been the site of a temple to Odin the chief god of the Vikings’ Heaven – Valhalla. Waterford City was known to the Vikings as Vadre Fjord – Fiord of the Ram, or the Windy fiord. It was founded by the Vikings in 853AD as a ‘longphort’ or dock for Longships. Its’ riverside location provided a sheltered harbour with the sea a few miles away, was an ideal settlement location for the seagoing race. Waterford celebrates its Viking Heritage and so any Viking descendants such as the Doyle clan are welcome. The so called ‘Viking Triangle’ of Waterford has been developed in recent years to highlight the Viking heritage of the city. It includes Reginald’s Tower and the Christchurch Cathedral. Christchurch cathedral was first built by the Vikings in the 10th century. Reginald’s Tower on the Quay dates back 1,000 years. It has a display of Viking artefacts and shows an interesting audio visual representation on Waterford’s history including the arrival of the Vikings. Woodstown, County Waterford is believed to be the site of a Viking longphort- dock for boats. It was uncovered in 2003 when the area was being excavated as part of the work on the N25 Waterford bypass road. The town of Inistioge in Kilkenny is mentioned in the Annals of the Four Masters. It says that in 962, the local Irish Ossorians won a battle with the Danes/ Vikings led by Amlaeibh, son of Sitric, where many of the Danes were killed along with Batbarr, son of Nira. The area is also near Bramblestown where a Doyle family of renown lived in the period from 1756 to 1856. Several generations of the family were successful military men. These included Sir John Doyle (1756-1834) who served with the British army in the USA. He was elected a Member of Parliament for Mullingar, Co Offaly and spoke in the Irish Parliament of the day. Colonol Arthur Doyle , a descendant of the Bramblestown family wrote a book ‘A hundred years of conflict, being some records of the services of six generals of the Doyle family, 1756-1856’. The name Doyle is included in some place names in Ireland – proof of the wanderings of the Vikings from which the name derives. Ballydoyle in Tipperary is one such place. It means town of the Dubhghall – ‘the dark foreigners’. Today the Ballydoyle name is world famous as the hub of a successful thoroughbred racing industry. Carlow Cathedral was completed in 1833 at the instigation of the Bishop of Kildare and Leighlin - James Warren Doyle, known as JKL - James, Bishop of Kildare and Leighlin. He is said to have been the outstanding bishop of the 19th century. He is buried in the cathedral and his tomb can be visited there. Read the history of the cathedral and bishop Doyle on the following link by scrolling down the screen. The Vikings founded Dublin around 841 when they built a fort where the River Poddle met the River Liffey at a ‘black pool’ the ‘Dubh Linn’ which gave Dublin its’ name. They also had a base at Wood Quay on the Liffey. Its’ remains were discovered during work to build Civic Offices for Dublin City Council in the 1970s. There was much controversy at the time regarding the treatment of the site. The Viking artefacts discovered can be seen at the National Museum and the Dublinia exhibition. A model or toy boat from Winetavern St. Dublin. When we consider, Dublin’s associations with the Vikings, it is no surprise that there are some locations around Dublin which include the Doyle name. The name of the Dublin suburb of Baldoyle derives from Bal meaning ‘town’ and ‘dubhgail’ meaning dark foreigner. This probably refers to the Danes who arrived as part of the Viking invasion in the eighth and ninth centuries. The town is said to have been a Viking base for several years. To day Baldoyle is a small town providing essential services for its residents. Some of whom must come from the original ‘dubhgaill’ inhabitants. Doyle's Corner is a well-known landmark in Dublin at the junction of the Phibsborough Road and the North Circular Road. Show your pride in your Doyle origins - claim your FREE, personalized Doyle Clan certificate here!